Why SPA getaway in Bulgaria? Because of the richness and the variety of the mineral sources in the territory of the country - there are 240 thermal springs. They have been enjoyed since ancient times by the Thracians and especially by the connoisseurs of the balneotherapy - the Romans. There are many springs that are captured by them which we always enjoy. Arrival at Sofia airport. Transfer to the hotel in Sandanski (Pirin Park Hotel 5* or Interhotel Sandanski 5*) - 165 km, about 3 hours. Free time to enjoy the SPA center. Overnight. Discover the town of Sandanski. Its climate is strongly influenced by the Mediterranean. It is located only 20 km from the Greek border . Its air is reputed for the treatment of lung diseases and it is a very sunny city with 2450 hours of sunshine per year. Sandanski is mostly a SPAcenter , with more than 80 thermal springs whose water temperature ranges from 42 to 81 ° С. The hot springs have attracted many since antiquity. The town dates from II-millennium BC. According to legend,this is the birthplace of Spartacus, the Thracian gladiator who led a war for slave freedom against the Roman Empire . The VI-th century the city was a major center Episcopal Christians in these lands. At the end of the sixth century the city was destroyed by barbarian tribes. It was known by the name name of Sveti Vrach until 1947, twen it was renamed after the Bulgarian revolutionary Yane Sandanski (1872-1915 г.). The city today was built on the ruins of a city at the time the young Byzantine Empire. There are remains of four basilicas Bishops. Central Basilica Episcopal date V - VІ s. and is famous for its magnificent floor mosaics . The Archaeological Museum is built on the foundations of the basilica of the bishop Yoan. The garden center is a favorite of locals and visitors. They are attracted by the numerous Mediterranean plant species (over 200) arranged on a total area of 344 ha. • Pirin Park Hotel 5* - 2600 m2 dedicated to wellbeing. The day passed quickly between fitness room, outdoor swimming pool (open from May to September), indoor pool with hydro massage of 29-31 ° С, the outdoor SPA - 38 ° С (open from September to April), indoor pool, jacuzzi, Finnish sauna, bio sauna, the fitness room, steam baths, jet cold, relax area with deckchairs . The pass is included in the price and there is also included a classic massage of 40 minutes. The SPA center offers a wide range of treatments and procedures for the face and body. • Interhotel Sandanski 5* - 3 floors reserved or well-being reign: mineral water baths and herbal sauna, steam baths, massages, wine procedures, facials - offers list is long.. In addition there are 3 swimming pools with mineral water - inside, outside and SPA - 38 °C. The pass is included in the price and there is also included a partial massage with hot stones. Overnight. Breakfast. A relaxing day at the hotel. The SPA centers in both hotels are made so we do not see the time pass. If you prefer to visit the city garden and you are at the hotel Pirin there is a shuttle to takes you to the center of Sandanski. If you are in Interhotel Sandanski and you like tennis you can enjoy one of the five tennis courts.Overnight. Departure to the Rila Monastery - the largest monastery in Bulgaria, inscribed on the UNESCO list of world cultural heritage monuments. This site seeing tour is provided with an English speaking guide. The monastery was founded in the first half of the tenth century. Over the centuries, the Rila monastery became the spiritual center of literacy and culture in Bulgaria. At the Bulgarian National Revival (eighteenth century - nineteenth century), the monastery has contributed to the creation of a fifty convents in major Bulgarian villages. The total area of the cloister, church, houses and farm buildings is 8800 m². The monastery consists of approximately 300 local, 100 are monastic cells. Hrelyu’s tower is now open to visitors during the summer. Part of the fourteenth century frescoes is visible through the windows of the chapel. The Historical Museum has exhibits relating to the origin and history of the monastery over the centuries. Some works of Bulgarian art abroad and fourteenth-nineteenth century are also exposed. The best part is the beautiful Rila Cross, the work of Father Raphael (Rafail). After years of hard work, Raphael completed his masterpiece in 1802 and would have lost his eyesight. Featuring a miniature sculpture in wood, the cross is decorated with biblical scenes 36, distributed equally on both sides, and more than 600 miniature figurines. The Ethnographic Museum and the reception rooms of the north wing contain typical bulgarian fabric tissues and national costumes from different regions as well as pottery offered by villages and pilgrims. The entrance fees are included. Free time for lunch. Departure to Sofia. Transfer to the hotel in Sofia (Arena di Serdica, 5 *). Upon arrival at the hotel you will have your first encounter with the history of this city that now bears his name 4th. These names are in chronological order Serdika, Sredetz, Triaditza, Sofia. At your hotel you will have the unique opportunity to take your coffee next to the remains of the Amphitheatre of Serdica (Arena di Serdica) built by the Romans in the 3-rd-4th century AD. It has an oval shape and measures 60 x 43 m, only a few meters shorter than the Coliseum in Rome. Its capacity was 25,000 spectators and you can see seven rows of seats that have remained in their original position. Sofia has been settled for many millennia. 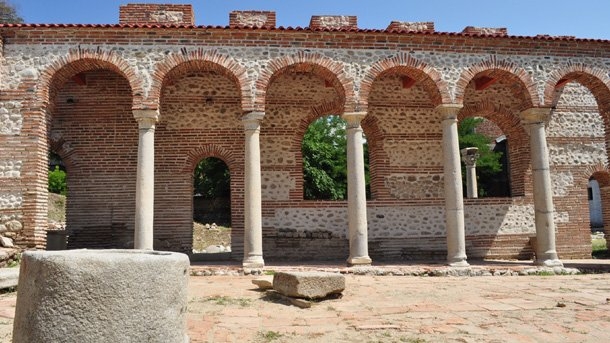 In honor of its hot springs, in the 8th century BCE the Thracian tribes settled here gave the city its first name – Serdika or Serdonpolis.In the 1st century BCE, Serdika was captured by the Romans, who transformed it into a Roman city. During the reign of Emperor Marcus Ulpius Trajan (reign 98-117 CE), the city took his name, Ulpia Serdika, and became the administrative center of the region. Serdika was the favorite city of Constantine the Great (reign 306-337), who said “Serdika is my Rome.” In roughly 175, massive fortified walls, with four watchtowers were built to protect the city , and a second outer fortified wall was added during the 5th-6th centuries. The city’s flourished for a second time under Justinian the Great (reign 527-565). At the beginning of the 9th century, the Bulgarian Han Krum (reign 803-814) invaded Serdika. The city became an inseparable part of The First Bulgarian Empire (7th-9th centuries) under Han Omurtag (reign 814-831). At this time the city was renamed Sredets (The Center), because of its central strategic location. In 1382, the city fell to the Ottomans. It was liberated five centuries later, in 1878, and on April 3, 1879 it was declared the capital of the newly-liberated Bulgarian nation. Sofia preserves many valuable monuments to its long and storied past. Overnight. Breakfast. Depending on the time of the flight - free time and transfer to the airport.